Barnet Unison, Barnet Trades Council and the Barnet Alliance for Public Services are fighting the ‘easyCouncil’ model of contracting out, privatisation and job cuts that the borough’s political leadership are trying to impose on the the people of Barnet. Join the march on 23rd March to stand together with them to defend Barnet’s public services! The Trade Union movement is facing its biggest challenge in over 30 years. The Conservative Home blog, think-tank of the Tories, is celebrating the drop in overall union membership as one of its major achievements. We are all organising to halt the attacks on our members’ terms and conditions, to resist mass redundancies, and last but not least to oppose the relentless privatisation of public services. If you want to demonstrate against the Tories, then where better to do it than in Barnet on March 23rd? Barnet has a Tory Council which is using mass privatisation to make hundreds of Council workers redundant and is attacking the Council trade unions for campaigning to defend their members’ jobs. The Council is proposing to delete almost all agreed time off for trade union representatives to carry out their duties. It is important that the trade union movement organises within its own community to support and build alliances with residents. We have seen that if residents learn about these cuts, they are prepared to act to defend them. Barnet Trades Council is calling on all trade union branches across our borough to make a pledge to send their banners and members to the Barnet Spring march on Saturday 23 March. We are also extending our invitation to the wider trade union movement across London and beyond. There is an alternative worth fighting for and the Trade Unions are very much part of it. 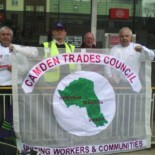 This entry was posted on February 12, 2013 by CAMDEN TRADES COUNCIL.